After a pilot expression, induction, purification and ligation assay with tag-XFP-catcher, we constructed 3 tag-catcher fused enzymes, that is glucose oxidase (GOx) from Aspergillus niger type X-S (E.C.1.1.3.4), horseradish peroxidase (HRP) from Armoracia rusticana (E.C.1.11.1.7), l-lactate dehydrogenase (LDH) (E.C.1.1.1.27). With fused tags and catchers, several important properties of these enzymes had to be tested in order for a better performance on our applied design products. To obtain the maximum of functional protein yield for electrode fixation use, the best expression strategy had to be applied and adjusted for different proteins. The variables could be different vectors, different purification tags or different expression conditions. After induction and expression, we verified our expression product by SDS-PAGE and Coomassie staining and desired proteins were observed in verification assays. GOx and HRP were well expressed for a yield >20mg/L in pET-30a(+) and BL21(DE3) after a 15℃ 16h induction. On the contrary, LDH can only reach a maximum yield of 2 mg/L in the same condition. In the subsequent experiements, we managed to find the best condition by changing the purification tag from His tag to His-GST tag or the host from BL21(DE3) to RosettaTM 2(DE3). 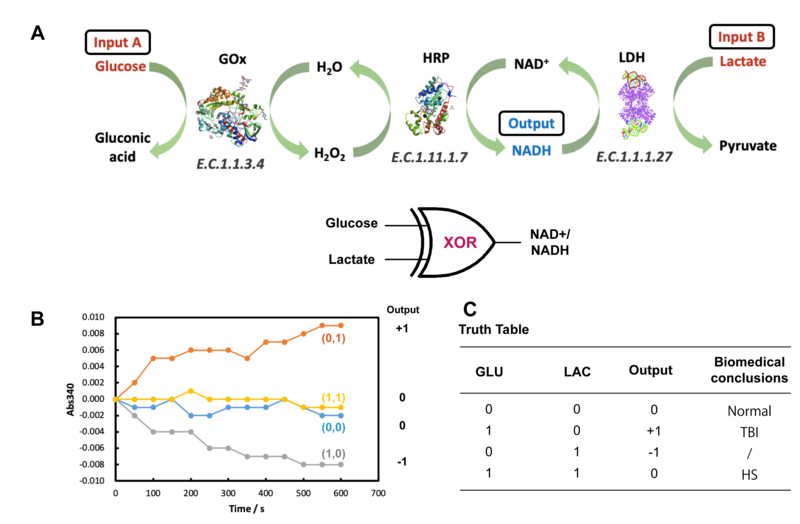 At last, we determined specific expression and purification strategy customized for each enzyme as showed in the diagram. Verification of expressed enzymes and purification afterward. (A) SDS-PAGE and Coomassie staining, Western Blot mapping showed success expression of GOD-His tag in BL21(DE3). (B) SDS-PAGE and Coomassie staining, Western Blot mapping showed success expression of HRP-His tag in BL21(DE3). 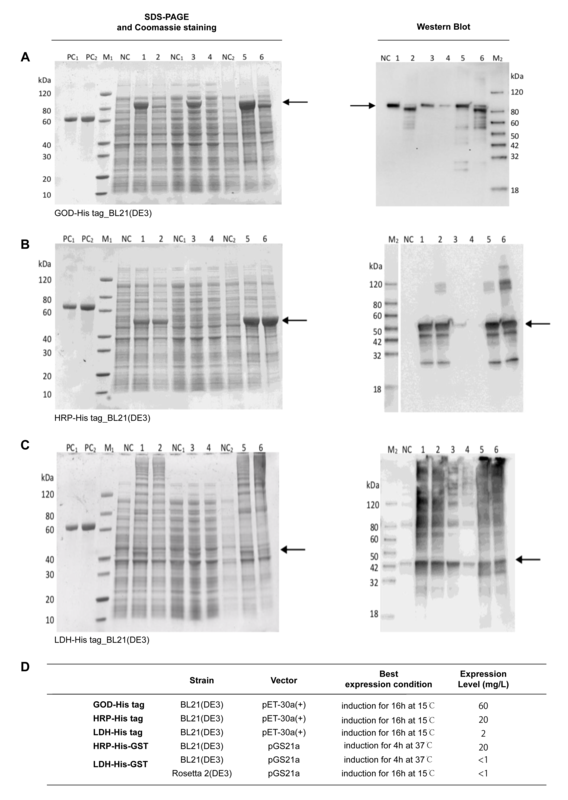 (C) SDS-PAGE and Coomassie staining, Western Blot mapping showed success expression of LDH-His tag in BL21(DE3). (D) The diagram showed different expression conditions for enzymes to find the best expression strategy for the maximum yield. To mediate electron in the active centers of enzymes to the surface of electrodes, some mediator must add to the surface layer of enzyme immobilization. As reported, Au nanoparticles (AuNP) have a nice performance to carry electrons to electrodes and also serve as an electron-transduction layer. While Curli fibers provide a biocompatible matrix for the enrichment of functional proteins, the conductivity has to be considered and Nafion has superior conductive properties which recently found a great application prospect in biosensor surface modification. But it still remained unknown whether AuNP or Nafion can play as an enzyme inhibitor. So, we had to test the optimal modification or concentration of AuNP or Nafion to maintain the maximum enzyme activities. As showed in figure, different enzyme has different response to AuNP, GOx (GOD) is sensitive while the activity of HRP and LDH is not largely influenced. For Nafion fixation, we ultimately decided a final dosage of 1.0 µL, while AuNP dosage was decided to be 0.5 µL. Optimal fixative condition in Nafion and AuNP for maximum enzymatic activities. (A) The figure shows while AuNP (0.5 μL) is added to the system, the activity of GOx (GOD) is significantly decreased. (B) Nafion gradient activity assay indicates Nafion has a profound negative influence on GOx. When Nafion dosage is ~1.0 μL, GOx maintains the maximum activity. (C) Figure shows AuNP (0.5 μL) does not cause significant inhibition to HRP. (D) Nafion gradient activity assay. When Nafion dosage is ~1.0 μL, HRP maintains the maximum activity. (E) Subsequent to experiements on GOx and HRP, final AuNP dosage was fixed to while Nafion, 1.0 μL, in order to maintain GOx and HRP activity at the maximum. Under this condition, LDH is not significantly inhibited comparing with native enzyme (definition of enzyme activity unit (U) of Lactate dehydrogenase: 1 mg of enzyme catalyze 1 nmol pyruvate per minute. The concentration of pyruvate is determined by the change in absorbance (A450) and the standard curve. GOx and HRP activities are all measured under kit manufacturing instruction). In the pilot expression assay, GFP-T (tag only) and GFP-TC (tag and catcher) showed distinct capability on fluorescence. So, we did experiments on the comparison of native enzyme activities and fused enzyme activities. 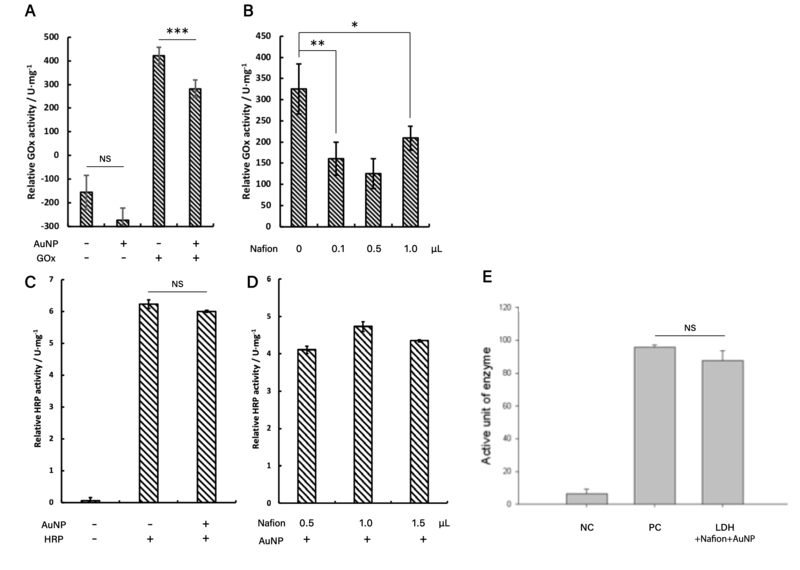 As showed in Figure 4B, modified enzymes showed a significantly decreased activity. Furthermore, to find whether the decrease of activity will affect the final performance of logic gate enzyme complex. We did tests on logic gate function with modified protein subsequently. Ligation results and comparison test of native and modified enzymes. (A) SDS-PAGE and Coomassie staining shows purified tag-enzyme-catcher proteins and ligation product. "a" arrow pointed to LDH-GOD complex (~110KDa), while "b" arrow pointed to HRP-LDH complex (~115KDa). B. Comparison test of native and modified enzymes. GOx (GOD), LDH and HRP activities were all decreased because of the fused tags/catchers and Nafion or AuNP. But whether the catalytic activity can still perform a logic gate outcome remained unknown. The ligation of tag and catchers and also the orthogonality has been illustrated in the tag-XFP-catcher experiments. After we harvested the enzyme product, we also did the test to find whether the final product can link together. Experimental data showed in Figure 4A. As the core of the project, coding traumatic shock related injuries requires a metabolic interacting enzyme complex to integrate two signals to one output (response on the electrode). 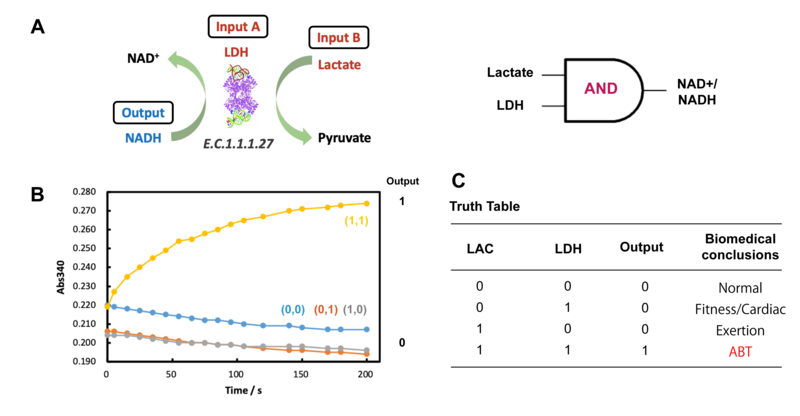 To demonstrate whether our design has the logic gate function, we made a simulation in the condition exactly the same with our final applied design (including the final concentration of AuNP and Nafion, and also the enzymes used were linked via fused tags and catchers). The difference lied in the final representation of output signal. In this experiment, we used the characteristic 340nm absorbance of NADH as showed in the schematic. On-electrode logic gate response will be showed in electrode section. XOR (eXclusive OR) gate. (A) Schematic view of the logic gate enzyme complex. Inputs are glucose and lactate while the outcome is reflected by NAD+/NADH concentration. (B) Optical measurement (λ=340nm) of the response of the enzyme complex with different input pairs in 600 s time period. (C) Truth table of XOR gate and biomedical conclusions for each output. In an XOR (eXclusive OR) model (showed in the schematic figure), the logic XOR gate accepts two independent input signals: glucose and lactate, producing H2O2 as an intermediate product and different NADH/NAD+ concentration ratios depending on the relative activity of the reductive and oxidative branches of the biocatalytic system. The physiologically normal glucose concentration, 4mM, was considered as digital 0 input signal, while the increased concentration of glucose, 30mM, was defined as an input signal 1. The lactate signal was considered as logic 0 for the physiological normal concentration of 2mM, while the abnormally increased lactate concentration of 13mM was used as an input signal 1. The result given by the XOR gate can be 0, +1, −1 and again 0. The last 0 output (corresponding to the 1, 1 combination of the input signals) has the physiological meaning that unveils a HS (Hemorrhagic shock) situation, while the +1 output has the physiological match to TBI (Traumatic brain injury). AND gate. (A) Schematic view of the enzyme logic gate. Inputs are LDH and lactate while the outcome is reflected by NAD+/NADH concentration. (B) Optical measurement (λ=340nm) of the response of the enzyme logic gate with different input pairs in 200 s time period. C. Truth table of AND gate and biomedical conclusions for each output. Another model of ABT(abdominal Trauma) detection takes lactate and LDH as two input signals. Logic 0 and 1 levels of LDH (0.15 and 1.0 U·mL-1) and lactate (1.6 and 6.0 mM). The results from ABT model can be 0 or 1 ( 1 indicates a biomedical conclusion of abdominal Trauma). Bocharova, Vera, et al. "Alert-type biological dosimeter based on enzyme logic system." Talanta 85.1 (2011): 800-803. Halámek, Jan, et al. "Multiplexing of injury codes for the parallel operation of enzyme logic gates." Analyst 135.9 (2010): 2249-2259. Pita, Marcos, et al. "Enzyme logic gates for assessing physiological conditions during an injury: Towards digital sensors and actuators." Sensors and Actuators B: Chemical 139.2 (2009): 631-636. Wang J, Polsky R, Xu D (2001). "Silver-Enhanced Colloidal Gold Electrochemical Stripping Detection of DNA Hybridization". Langmuir. 17 (19): 5739. Daniel MC, Astruc D (January 2004). "Gold nanoparticles: assembly, supramolecular chemistry, quantum-size-related properties, and applications toward biology, catalysis, and nanotechnology". Chemical Reviews. 104 (1): 293-346. Heitner-Wirguin, C. (1996). "Recent advances in perfluorinated ionomer membranes: structure, properties and applications". Journal of Membrane Science. 120: 1-33. Barnhart, Michelle M., and Matthew R. Chapman. "Curli biogenesis and function." Annu. Rev. Microbiol. 60 (2006): 131-147.